AERE continued to move NE in the past 24 hours. At 20 HKT, AERE was centred about 240 km (130 NM) NE of Okinawa. AERE is the 111th name in the tropical cyclone name list. It was contributed by the United States, which is a Marshallese word for "storm". 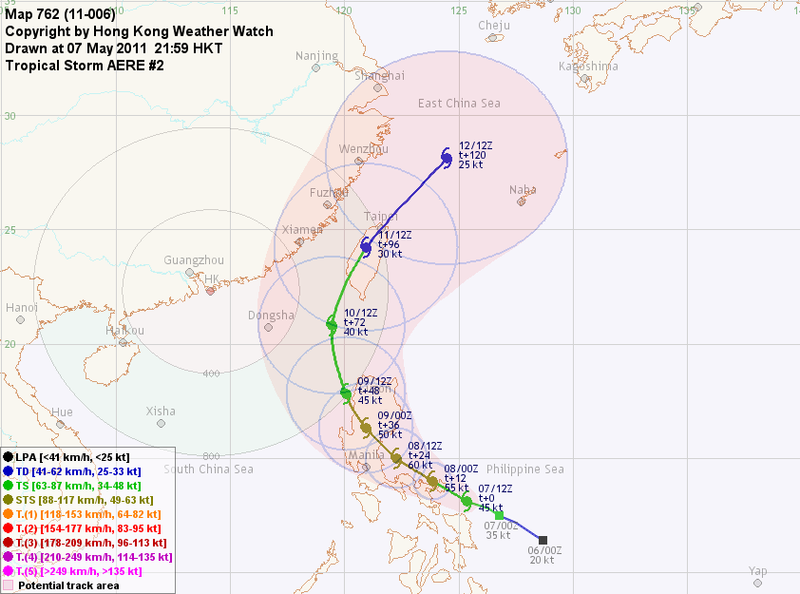 This name was last used in 2004, the storm associated with which necessitated the Standby Signal in Hong Kong. AERE is expected to move NE turning to ENE along the northwestern periphery of the subtropical ridge. AERE turned smaller in size. It is expected that the storm will undergo extratropical transition soon and should be complete by around 36 hours' time. This is the final bulletin on AERE. AERE has started to recurve. At 20 HKT, AERE was centred about 600 km (320 NM) SW of Okinawa. AERE has crossed the subtropical ridge axis and is now recurving along its northwestern periphery. Motion speed should increase as it reaches the westerlies. AERE starts to enter seas with lower temperature. The storm is expected to start extratropical transition in about a day's time and transition should be complete by Thursday. AERE has weakened into a tropical storm. At 20 HKT, AERE was centred about 400 km (220 NM) NNE of Manila. AERE is now crossing the subtropical ridge axis, and will recurve along its northwestern periphery in the next 2 to 3 days. 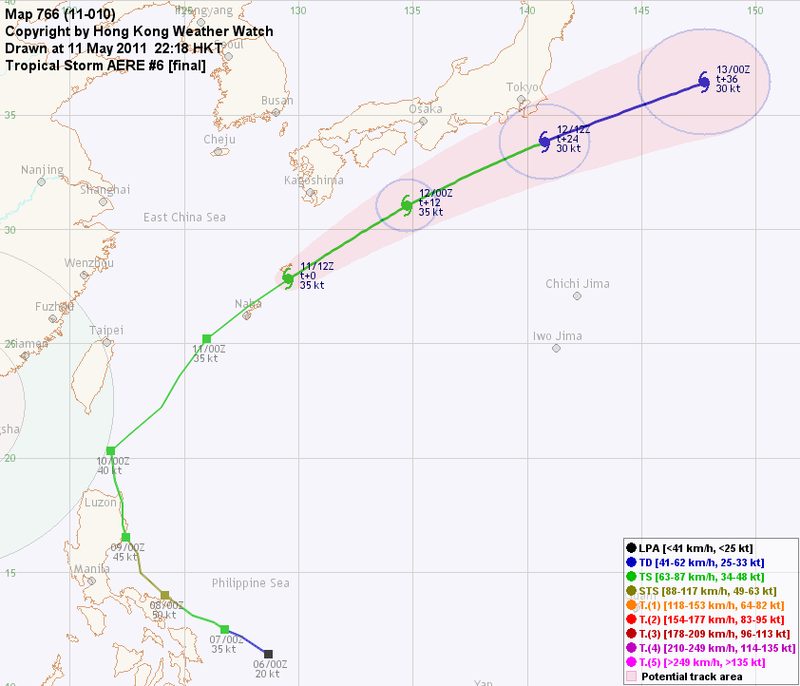 AERE's structure has deteriorated as it touched Luzon. As AERE continues to move northward, sea temperatures will drop and shear will rise. AERE should weaken and extratropical transition should occur in 2 to 3 days' time. AERE has intensified slightly over the past 24 hours, and has started taking a more northerly track. At 20 HKT, AERE was centred about 230 km (130 NM) E of Manila. AERE is situated in the southwestern periphery of the subtropical ridge. 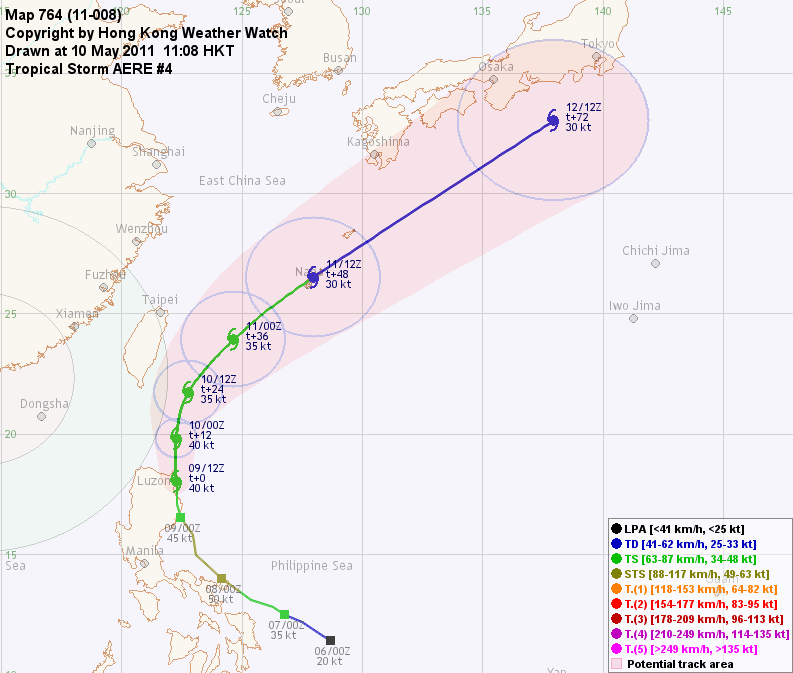 It is expected that AERE will round the western side of the ridge and recurve near Taiwan. AERE's low-level circulation centre was again partially exposed this morning. Due to its proximity to land, AERE is expected to maintain its current intensity until landfall, after which the mountainous Luzon will weaken the storm considerably. Weakening trend continues as it re-enters sea, due to the relatively high shear and lower sea temperatures near and north of the Luzon Strait. 03W has intensified into a tropical storm and was named AERE. At 20 HKT, AERE was centred about 510 km (270 NM) ESE of Manila. Attacked by mid-latitude troughs, the subtropical ridge northeast of AERE has shown signs of retreat. AERE is thus expected to recurve along the western periphery of the ridge in the long run. AERE's convections are tightening and its structure in the southern semicircle has improved. In a generally favourable environment east of the Philippines, AERE should continue to strengthen into a severe tropical storm in the next 12 to 24 hours. 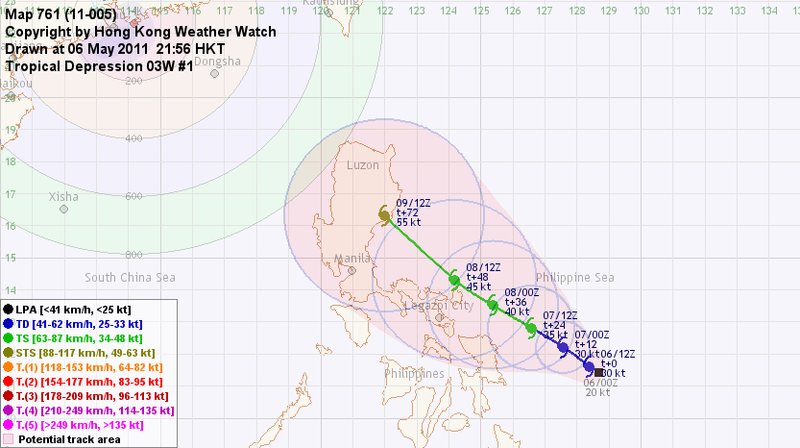 AERE is expected to weaken considerably as it makes landfall at Luzon. Weakening trend continues as it re-enters sea, due to the relatively high shear and lower sea temperatures near the Luzon Strait. The disturbance east of the Philippines has strengthened into tropical depression 03W. 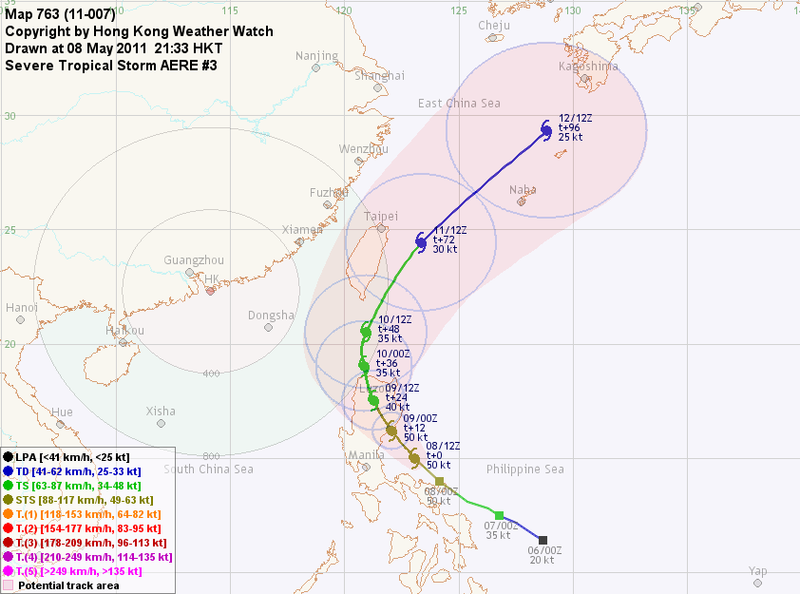 At 20 HKT, 03W was centred about 870 km (470 NM) ESE of Manila. 03W is currently situated in the southwestern periphery of a subtropical ridge. The ridge should guide the storm in a northwesterly motion over the next 72 hours. Speed is expected to increase as steering influence strengthens. 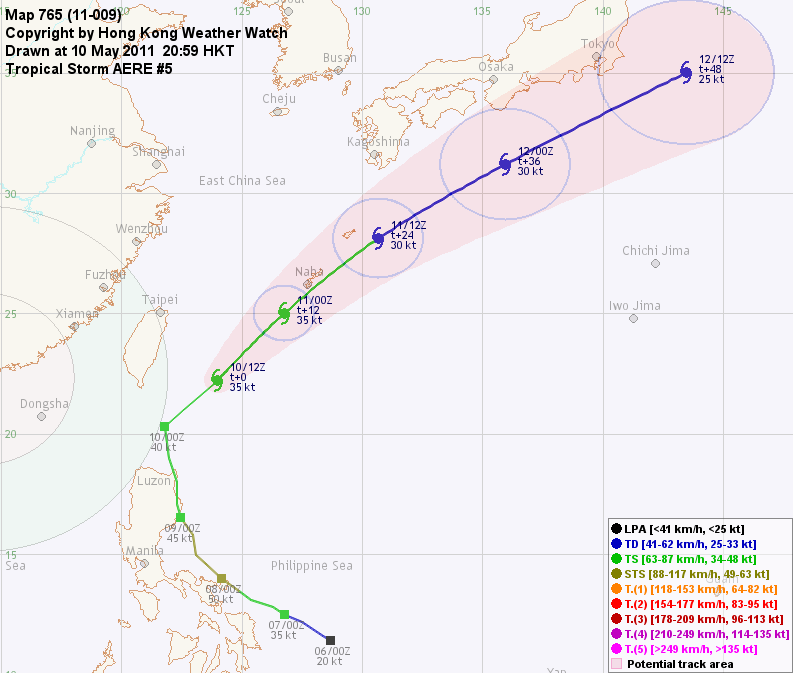 03W is organizing gradually, and is symmetrical in shape due to the extremely low vertical wind shear in its vicinity. Together with sufficient sea temperature (about 30 degrees) and favourable outflow channels, 03W should strengthen progressively in the next 72 hours.